Voters in Kaduna State made history as the first electors in Nigeria to use electronic voting on the 12th of May, 2018. Elections took place on that day in a new format, not used before in Nigeria, to elect Chairmen and Councillors for the 23 Local Government Councils in the state. 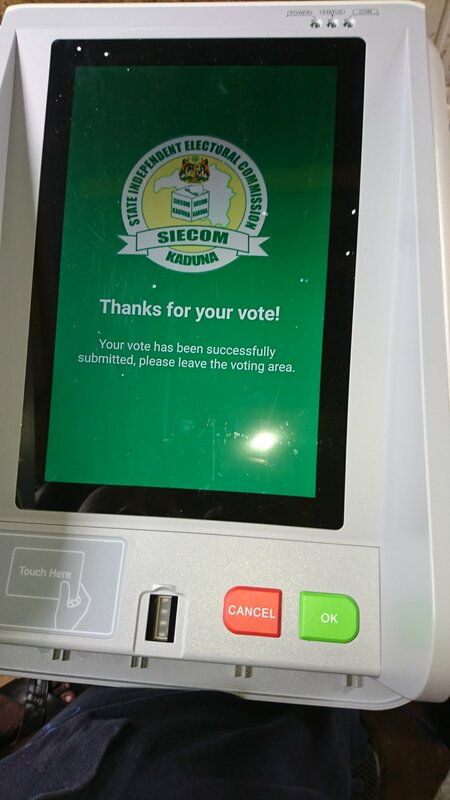 This development was first of its kind to happen in Nigeria as Kaduna State became the first sub-national to adopt electronic voting following at least ten countries currently use it. In fact, the election made Kaduna State the second place in Africa to use electronic voting, after Namibia. This novel action reveals the possibility of merging politics with technology. We therefore, call of the Independent National Electoral Commission to learn from the Kaduna state electoral commission on how it succeeded in making such mix a possibility. This entry was posted in Eye Reports by Paul Iregbenu. Bookmark the permalink.